Almost all teenagers are religious but their views of God and faith vary widely. Most seem to think God exists but don’t believe He is very involved in life on earth. This has serious implications for Christian parents and the role they play in helping their kids. 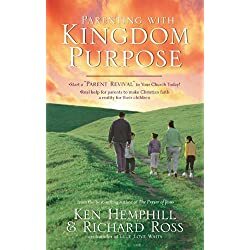 Parenting with Kingdom Purpose from youth ministry pioneer Richard Ross (True Love Waits, 24-Hour Counselor) and respected Christian author Ken Hemphill will help Christian parents see what the reality is instilling in their students a faith that has a foundation. Ross and Hemphill will help parents see what they need to be and what they need to show students for faith to be a reality for teenagers today.